Almost one-fifth of the American population is expected to be age 65 or older by 2030, according to the U.S. Department of Health and Human Services Administration on Aging. At the same time people are living longer and fuller lives, many are living with chronic conditions that require extra care and assistance on a daily basis. The type of care people receive can impact not only their quality of life, but also their overall well-being and the costs of their care over time. What each of these people will, and do, need is a system that allows them autonomy, respect, support, and freedom from stigma. In this approach to care, it is necessary to consider that everyone has a unique level of ability. Each individual is more than a manifestation of their diagnosis. 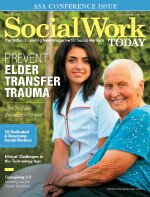 A person-centered approach in social work looks at each individual's history and circumstances. In home care, we look at it this way: There are many clients who require assistance to live safely with Alzheimer's disease; that doesn't mean that every person with Alzheimer's disease requires the same exact intervention. Rachel was 76 and living with Alzheimer's disease. One of the symptoms of Rachel's illness was wandering, which is common for many people with dementia. Rachel's neighbors were concerned about the wandering and would call the local authorities; the local authorities would call Rachel's children, who lived in another city, making it impossible for them to react after each call. That is when professional in-home care was established to help Rachel and ease the concerns of her family and neighbors. Our approach was not to confine Rachel, but instead to factor in her life experience as a teacher, mother, and world traveler. On the days that the agency provided care for Rachel, we would walk to the local park where she giddily greeted young children as we sat on a park bench and enjoyed the afternoon. When Rachel would insist she had to get to the airport for a trip, another caregiver would drive Rachel to the airport and ask if she had her passport. When Rachel said no, the caregiver would say they could come back another day—and they did so often, with the same routine. Rachel was always joyful during these outings. Her care was centered around her and her interests. As her cognitive functions deteriorated to the point where, for her own safety, her children moved her into a long term care home, we were still able to provide meaningful opportunities that continued to nurture Rachel's spirit. This care approach comes instinctually to some, but has also been adapted from the teachings of the Eden Alternative. The Eden Alternative was founded to be part of changing the culture of aging and advocates a person-centered approach to care. One of the central tenets of the Eden Alternative is that "person-centered care is an approach that frames care through the eyes of the person receiving that care. Choices and actions are based entirely on the unique needs, desires, and preferences of this person." In Eden at Home, caregivers are trained in how to apply this philosophy so that each client receiving care is able to have a meaningful experience. Each person has a life story, which they are still growing into and living every day, to share. Their care plan allows for different caregivers to better understand how to maintain this type of care. This international nonprofit organization identifies the three "plagues" of elders as loneliness, helplessness, and boredom, and a person-centered approach to care can be a solution to eliminating these plagues. Loving companionship is the antidote to loneliness, spontaneity is the cure for boredom, and the opportunity to give as well as receive care can alleviate helplessness. As caregivers seek to allay these plagues with person-centered care, they will also be engaged in a meaningful relationship; the caregiver and client are creating purpose together. Many studies have shown that people who have a purpose in life may live longer. Furthermore, research has shown a connection between loneliness and depression, and between depression and dementia. Aging can affect one physically and cognitively. As the body changes, there is the potential for social isolation—for example, if someone is managing incontinence, or has hearing or memory loss, they may be less willing to socialize, which then leads to loneliness and raises the risk of isolation. It is important to remember to look not only at the visual and obvious presenting issues, but also their overall impact on the client. In order to determine a full picture of who each client is—above and beyond the presenting issues, which may be preventing them from performing their own daily activities—a unique, in-home care plan is created. This care plan reviews not only a person's current abilities and how they are changing, but also their personal interests and preferences for everything from food and culture to activities and conversational topics. The American Association of Retired Persons found that 90% of elders want to "age in place," meaning that they want to remain in their own homes and not move to nursing homes or assisted-living facilities. A main reason for this choice is to retain one's independence and freedom to choose what to do and when to do it. Also, people likely have treasured memories and familiar routines that provide comfort in their homes. However, as people age, perhaps living alone for the first time in their lives, and their family moves away or their own abilities change, they can become isolated and overwhelmed, resulting in feelings of loneliness, helplessness, and/or boredom. Studies published in the Journal of Neurology, Neurosurgery & Psychiatry have shown a link between loneliness and depression leading to an increased risk of dementia. Depression, however, is not an inevitable part of aging. A holistic care approach, as taken by Eden, is a way for people with changing abilities to continue having meaningful connections and a life with purpose while alleviating overwhelming feelings of incompetence. With a person-centered approach to care, the social worker, caregiver, or even family member can engage the individual who needs assistance in many ways throughout the day. A more traditional approach for any type of assistance might be to just tackle a chore list to be checked off, rather than use this care as an opportunity to grow and work together. For example, a caregiver using a traditional approach might come in and prepare meals for someone who can no longer perform the various and potentially dangerous tasks in a kitchen—from cutting foods to handling hot pans on a stovetop. With the person-centered approach, the first step is finding out if this person used to enjoy cooking for themselves, what their favorite foods are, and where they prefer to eat in their house; their abilities to participate in making a meal can be determined from there. In other words, the caregiver is getting to know the person and not just their limitations due to illness or age. Perhaps the client can be driven to the grocery store and select the foods they prefer, or they can talk someone through the making of a favorite meal so that both people are participating in the process. This focuses on what this person is currently able to do, not on what they are unable to do. For people who have long enjoyed cooking, this can contribute to a boost in their self-esteem. The simple act of making a meal becomes an engaging, enriching, and empowering experience for the client, rather than a reminder of what they can't do for themselves. When this empowering approach to care is employed, it creates the opportunity for a two-way street in the relationship as well. The caregiver is not just giving care to someone, but also learning from him or her. The dynamic shifts and allows both people to have a meaningful and even joyful experience as they learn together. There are many examples of caregivers who, when using a personal approach in caring for a client, can establish a more reciprocal relationship. These relationships offer opportunities to give as well as receive, such as the client teaching the caregiver to knit, cook, or sand a piece of wood. By listening to their client, the caregiver is better able to understand and "be in the moment" with their client as they enjoy a simple pleasure. Those providing care should always take the client's personal and unique interests and abilities into consideration, while ensuring that their physical needs are being met as well. A person-centered approach to care embraces all that a life fully lived has to offer and helps that person to continue growing by building on their current strengths. — Wendy Birkhan, RSW, is a certified Eden at Home associate and director of operations at Homewatch CareGivers serving Ottawa, Ontario, Canada.